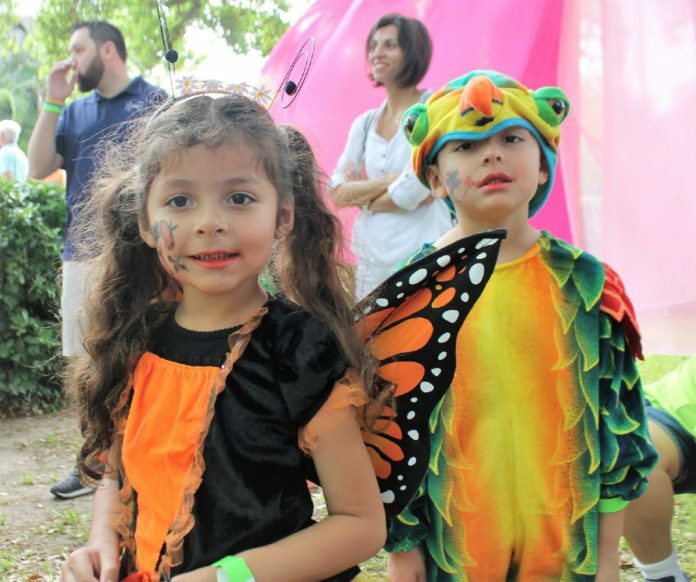 Hailey, left, and DJ are dressed in insect costumes and pose after the Bug Parade on Saturday at the Monarch Festival at Quinta Mazatlán in McAllen. Many of those attending also dressed the part by wearing costumes of a butterfly or a cocoon; others dressed in all orange, the color of the butterfly. McAllen Mayor Jim Darling spoke to the large crowd from the main stage and encouraged everyone to take time to appreciate the monarch as it knows no borders and travels back and forth between the United States and Mexico. The center was filled with a variety of items and activities for children and adults to entertain themselves, such as storytelling of “The Very Hungry Caterpillar” by the McAllen Public Library staff in the Tot Corner. There were also hands-on activities like making a monarch bracelet, where children had the chance to color a butterfly any way they wished and then wrap it around their wrist using a pipe cleaner. Around the pool area there were artisan vendors including the marketplace inside selling all kinds of goods. On the north lawn and around the main stage were performances by Deborah Case Dance Academy, a magic show by Oscar Muñoz and face painting. Toward the back of the center was the Discovery Center that offered scout and youth stations. There young scouts were able to earn badges by participating in activities such as painting, games and other arts and crafts. The space not only served scouts, but anyone who wanted to join. Attendees Felix and Jessica Viacobo from Weslaco decided to attend after seeing the event publicized online and on a billboard. The Viacobos said the kids had done the butterfly bracelet, made insects out of clay, listened to the storytelling and were continuing with other activities. They said it was their first time visiting the center, as well. Another visitor was the Cardoza family from McAllen who attended because Michelle Cardoza’s daughter is a Girl Scout and was able to receive recognition for completing the activities. The family was in the middle of viewing a display about tortoises at the indoor museum’s Discovery Center, seeing everything from the eggs to the outer shells. “I didn’t expect so many people,” Cardoza said. “We’ve gone through the pond walk, through the mosaic, through the butterfly art, just stopping at everything. “We’ve done some of the activities, we got our hands dirty with the soil earlier and planted together, as well,” she added.